In the time since we last spoke, I’ve revised the manuscript for my next book! I’ve traveled alone with my five-month-old baby to a family wedding on the other side of the country! I’ve felt like an Olympic gold medalist for having survived traveling alone with my five-month-old baby to a family wedding on the other side of the country! I’ve consumed biscuits and dark chocolate milkshakes and fingers and cheeks, listened to Fugazi and almost remembered what it felt like to be 15 and have a crush on Guy Picciotto, tried two recipes for healthy cookies, decided that I’m not into healthy cookies, made my daughter wear a pair of sunglasses that were intended for a doll, and rekindled my love for farro. The usual. I don’t know what made me think of farro again, but I’m glad I did. A few years ago, I went through a period of cooking it regularly, but then I forgot about it. I’m good at that. Farro went the way of this apple cake, these oatmeal popovers, this egg salad, this broccoli soup, and this boiled kale, foods that I love but almost never think to eat. But: yesterday I bought farro for the third time in less than a month. The third time! LOOK OUT. A billion (or five and a half) years ago, when Brandon and I got married, one of the dishes that our caterer made for the reception was farro with caramelized onions, carrots, celery, and feta, with a red wine vinaigrette. I didn’t have much experience with farro, but I liked the sound of it when they suggested it, and it was, in fact, terrific: chewy, nutty, and complex. In its uncooked state, it looks a little like barley, and once cooked, it looks a lot like brown rice, but its flavor is more interesting and lighter somehow than either. For the past few weeks, I’ve been cooking big batches of farro and stashing it in the fridge, scooping out a few spoonfuls at lunch or dinner as the base for a hearty salad. I’ll bet a lot of you do this, too, with some grain or other? At first, I threw in whatever I found in the crisper drawer and any leftovers that were lying around, but slowly, over a number of days, I settled on a few ingredients that got along especially well. The flavors in my salad are not unlike the farro salad from our wedding, but mine is quicker to make, more of a bang-it-together thing. I’ve been sitting on this post for a while, wondering if this recipe – if you can even call it a recipe – was too simple to write about, but then I decided that if I like it enough to eat it a few times a week, well, you know, what the hell, why not. Let’s call it a warm farro salad with chickpeas, feta, and spicy dressing. You’ll need a good-sized bowl – maybe the kind they call a pasta bowl? I use a medium-sized mixing bowl, because I’m a classy lady. Whatever you’re using, put a nice amount of warm farro in the bottom of it, and then pile on a spoonful of chickpeas, maybe half of a sliced carrot, a handful each of chopped escarole and radicchio, and a generous hunk of feta, crumbled. You could also add some small pieces of cooked chicken, if you want, or leftover steak or braised pork, and other raw or roasted vegetables. Everything is negotiable, except the feta. DO NOT SKIP THE FETA. Then you douse your salad with a dressing that’s essentially nuoc cham: fish sauce, lime juice, sugar, water, garlic, and a chile. You are now ready to sit down with your mixing bowl and eat. There’s something very special, I think, about the union of farro and feta, and then the chickpeas, the bitter chicories, the sweet carrots, and the salty-hot dressing: it’s crunchy and juicy, now warm, now cold. It was my dinner yesterday and my lunch the day before, and if I’m lucky, it’ll be my dinner tonight. I’ve found farro in Seattle at Whole Foods, PCC, and some grocery stores, or you can get it from ChefShop. I like the farro grown by Bluebird Grain Farms of Winthrop, Washington. Farro should be soaked briefly before cooking, although Matthew often uses Trader Joe’s quick-cooking farro – done in 10 minutes! – and says that it’s great. In any case, I give instructions below for cooking standard farro, and hey, feel free to scale up and cook an even bigger batch, if you’d like. From one cup of uncooked farro, I wind up with enough cooked farro for three or four servings of this salad. Also: among types of feta, I like French feta best. To assemble a portion of salad, scoop out a couple of large spoonfuls of farro – maybe 1/3 to ½ cup – and put it in a wide bowl. 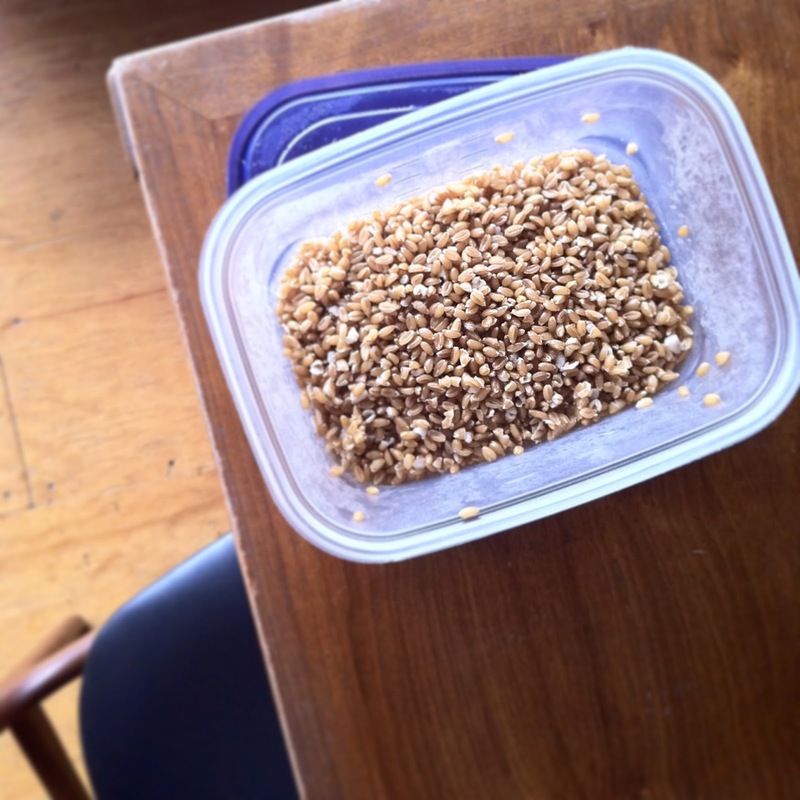 If the farro is cold, you might want to microwave it for 45 seconds or so, to warm it. That’s what I do. Or you could put it in a small ovenproof dish, covered, and bake it for a few minutes to warm it. Or you can just leave it cold. Add a large spoonful of chickpeas, a good handful each of escarole and radicchio, and maybe half of a carrot, sliced. Top with a generous amount of feta, and then drizzle some dressing – maybe a tablespoon? Or to taste – over the whole thing. Toss, and eat. I've actually never tried farro, but I bought some in Italy last year because it seemed like it would be a good idea. Now I know what to do with it, thanks! Oh how exciting. I've been checking your feed daily and then wham! there it is. Love the reminder for farro at the very least and love hearing what simple lunches become staples. Way to go on the travel with the babe! Sounds perfect! I love lettuce-less salads like this. I guess it isn't technically lettuce-less, but it isn't the main event, right? Lovely to see you online again! Farro is wonderful! Man I miss Seattle. We moved to Bend, OR 2 years ago and I love it – but the menu at “The Wandering Goose”. Oh my. 2 tickets to SEATAC please. Farro looks lovely. Always hang on your every word. Haven't ever tried farro, but this sounds absolutely delicious. She is rocking those glasses! I was introduced to farro by Thierry Rautureau last year. He made it into a brittle. It was brilliant although it stuck in my teeth! I much rather it as you describe … and in a salad. This is the way I usually do lunch, too! I second the 10 minute quick-cook Farro at Trader Joe's; for under two bucks it's a good option for anyone looking to try Farro out. Also, Juuuuuune! What a doll! I love farro but my husband (who grew up on overcooked white rice from both his Puerto Rican mother and Iraqi grandmother) finds it too “chewy”. More for me, I guess! Never would have thought to pair a fish sauce dressing with feta, but I can't wait to try it. I'm very excited about this – it may well help me move even further down my path of evicting the Mid-Day I-Only-Want-Donuts Demon that has invaded while we've been packing. I'm especially excited about the dressing – coming up with interesting dressings does not come naturally to me. Will probably try it with regular wheatberries or another grain until I can get my hands on some farro. Mmm. Congrats on revising the manuscript!! Your little one is so sweet and kudos for traveling with her by yourself. Happy friday! First of all, seriously too cute to pop, and I don't mean the sheets (but they're cute too). This is so funny because I was cleaning (really rampaging around) the pantry upstate and found a bag of ……farro, which I got at DiPalo's. Now I know what the heck to do with it. Good one! Thanks, Molly. but really, feta, schmeta. just don't skip those cheeks. I, too, have recently re-discovered my love for farro and I, too, typically eat my lunch from a mixing bowl. I believe that makes us Classy Lady Kindred Spirits. We should start a club. Awesome, thanks for the recipe! and your baby is super dooper cute. oh and you do deserve a medal for the travelling. It's tough work! Yes – how do we always forget the things we like! Farro – very good. I went through a period last winter when I was making farro risotto nearly every day (so good, you just can't stop) until my husband kindly told me to stop. I shall try this salad, and look forward to your book. Cheers to you for being, as always, such an accomplished, inspiring lady – and for posting pictures of your daughter in those sunglasses. Made my day. I had a Farro Risotto at Urban Table in Morristown NJ a few weeks back and swear that it was the best thing to cross my lips in the past 6 months. I recreated it at home less than a week later and let me tell you, farro reigns supreme over arborio rice. Molly, yours is one of five blogs I check every morning so always a huge delight to see a new post. I have to say I've never even heard of farro, so I might just have to try out Trader Joe's!! June is adorable! Love me some Faro, the babydoll is absolutely darling, love the sunglasses..So good you are back, somewhat, don't know how you do what you do at all, we went to Seattle Feb 2 the powers for parking meters make it impossible to park anywhere and the amounts they charge, the meter lady was kind in fremont, but so so so expensive to park anywhere, don't they want people to go to PCC and get organic and neat fresh, veggies and fruits, etc..We were not impressed, but LOVED Macrina bakery found a place to park in Queen Anne and had us some organic coffee, and lunch, the people know our daughter from when she lived right down the street and would walk up for brunch, lunch, etc..they spoiled us, even got some Macrina cafe vita organic coffee and the best tasting mini lemon sour cherry coffeecake ever..But I think Seattle downtown is not conducive to any small business, we could not find a place to park to get some Thai food our favorite so my hubbs walked and got it and took it to us via a bus, it was still hot when he got to us, and we were staying at a condo in lodo to boot!!!!!!!!!!!!!! just my opinion!! Yay! I love farro and can't wait to make this salad. Thank you so much for sharing pictures of June, too. She is the cutest little girl! Love the baby picture and love farro. Looking forward to trying this recipe! She looks adorable in her doll-sized sunglasses. ooo, this salad sounds lovely! Yes to cooked grains in the fridge! I mostly do short-grain brown rice, but barley and quinoa make appearances from time to time as well. They usually find their way into quesadillas, but a tangy full-lunch salad sounds like an even better idea. 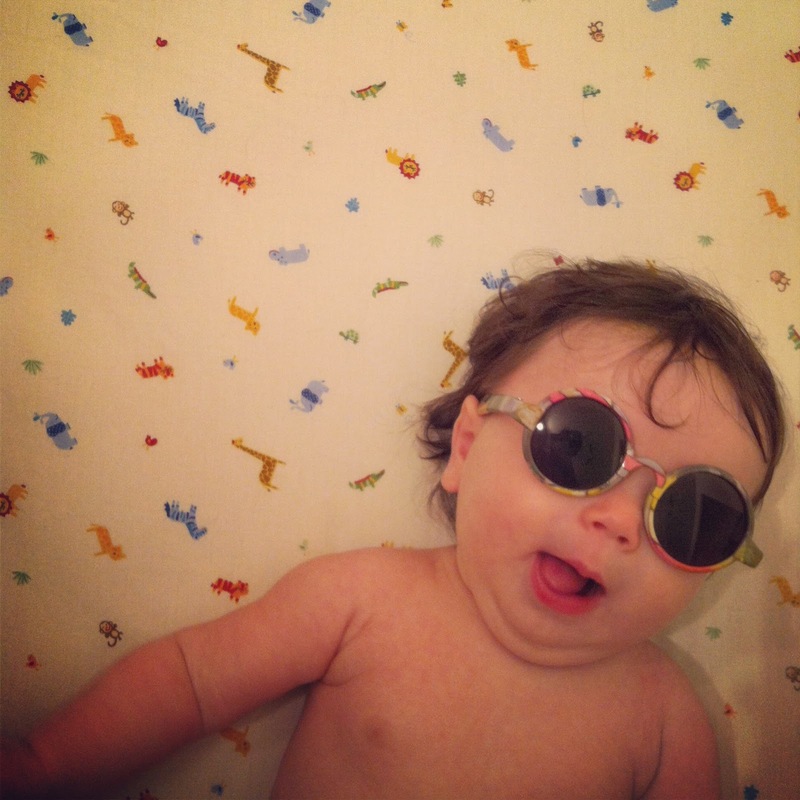 Very adorable baby and what cool shades. I will definitely be cooking a big pot of farro to make this salad for lunches and quick meals during the week. My 12 year old daughter, who has a crazy schedule, would absolutely love this! I may sub out baby kale for escarole because I already have it and it will go bad otherwise! Love that you mentioned you prefer french feta (is that the saltier one?) I have spent quite a few minutes standing in front of various types of feta waiting for some sort of epiphany or feta fairy godmother to show me the way! I will try the french style next! By the way I am in N. CA and I bought a 3 lb. Bag of organic farro (Di Amante brand) at Costco. Not all Costco's have it – I.e. San Mateo…NO! But Redwood City…YES! So, you may want to check it out there as well. Thanks again and enjoy your gorgeous daughter! I haven't tried farro, but keep hearing about it so I will make sure to cook some soon! And congrats on your cross-country trek with child! I cannot wait for your new book to come out! I'm re-reading your first one right now! That baby is beyond cute!! I have just discovered the glory that is boiling grains like millet, couscous, or quinoa in vegetable juice. I've only used carrot juice so far, but, not only does it turn the grains a delightful orange, they become SO tasty and add a whole new element to a salad. And I think it's the simple things that need to be shared most. It's so easy to overlook the simple and forget how delicious it is! I love your writing and I'm looking forward to your next book (loved the first)! I have a bag of farro in the pantry, waiting for inspiration, so thank you. PS – whenever I make the choc-chip banana bread from your book (it is our fav but I admit to using ground ginger instead of crystallized), I think of you fondly! Glad to hear that you're doing well with the new baby and all. This looks fantastic. I would eat my laundry if it had this dressing on it, so you had me at 'nuoc.' One of the most hilarious memories of my adult life involves my first solo trip with my first baby. Note to file: don't wear button fly jeans with a belt when traveling alone with an infant! Thank you for the salad and the memory. June is too adorable in those baby sunglasses! and your farro salad – i've been craving it, and didn't even KNOW it. now, to dig out my farro! YUM! You pretty much always give me a smile or today a giggle. My eldest daughter, your number one SM fan, has SERIOUSLY been listening on constant rotation to all your podcasts, asking me constantly when are they making more mum? And I too, for although I love you both, how much sour cherry can one woman take, as the same question! Thanks for mentioning Matthew's book though, we'll go over and kick in something! Love Farro, first heard about in in Italy when our tour guide sat with us at lunch and had faro “cereal” soup. I was hooked when she let me taste it! Sadly, I can no longer digest a lot of this yummy and nutritious high fiber stuff…but I did just reach 5 years cancer free after a movie worthy bout with colon cancer! The glasses are so cute! It's amazing how much work it is to learn how to do everything in your life with the addition of your first baby. Even more amazing, is that it will soon be second nature to you! By the time my 2nd arrived (now 25), the only big change was the way the laundry seemed to expand exponentially…lol! It's important to distinguish between whole grain farro such as Bluebird's and most of the other, usually imported, farro available. Full disclosure: I sell Bluebird's faro. Anyway, the majority of the farro sold has been pearled, much like barley, to remove the outer shell of the grains (on Italian farro, look for perlato or semiperlato). The pearled farro doesn't require soaking and cooks like most of the magazine recipes say (cook for 20 minutes). I recommend soaking the whole grain farro for at least a few hours, better overnight, then simmering in salted water for about an hour. The grain absorbs more water, gets a little softer though still quick chewy, and just tastes better. Loved this post which is full of personality and good ideas. Particularly love the baby in the shades. She is clearly already imbued with personality. Your June is such a darling! Great to hear you all doing so well! Hellooooo, all! Hope you're having a good weekend. And Jim, a pleasure to see your name. When I wrote about farro here a few years ago, I mentioned the possibility of it being pearled, but in the time since, I've never actually seen it sold that way – maybe because the stores I frequent mostly carry Bluebird's farro? In any case, I'm glad you brought it up, because I'll bet a lot of readers will come across pearled farro. And I'll try your suggestion of soaking Bluebird's farro overnight and cooking it a little longer. I really like the texture and flavor that I get with a 30-minute soak and about a 45-minute cooking time, but maybe it's just because I haven't had it your way! Thank you. Oh yes, huge fan of the farro-mushrooms-feta combination mentioned above. YUMMER. This salad — it is a salad, right?— seems like it would feel light, without necessarily being light. I am not big into tricking myself, but I am lately very big into eating dessert (read: cake) directly after most meals. This seems like something that pairs well with cake. Thank you for this post and recipe. These type of recipes end up being my favorites because they become the ones I make again and again. I have a container of your chickpeas with lemon olive oil and Parmesan in my fridge now. And your boiled kale and black beans are stoles in our house. I am with you that I generally don't like healthy cookies. Try 'Lalo's Famous Cookies' from My Fathers Daughter, Gwyenth Palotrows cookbook. I received this book as a gift and did not expect to like it, but it has some really great recipes. Theses cookies are wonderful. Perfect afternoon cookies with hot tea.. I'm going through a bit of a farro phase as well. I'm sure you've tried it, but if not, Anson Mills has the most wonderful of all the farro in the land! And good packaging to boot. And, in a pinch, Trader's has a perfectly workable 10 minute farro that I may use to make your lovely recipe this afternoon. Thanks! Good for your for traveling alone with June! That's a huge accomplishment. I'm still trying to figure out how I can go grocery shopping alone with my little. Farro is one of those grains I've been obsessed with ever since I discovered it in Italy…it's pretty special. Love, love, love. I'm on the forgotten farro train as well, and thank you for reminding me to add it to the grocery list. And the feta! I know you're a busy mama these days, but I'm always thrilled to open my reader and see a new! post! from you. Maybe the farro I brought over with the white bean stew around New Years kick started the rekindling?… I love it, too. there is a bag of farro that has been sitting in my cupboard for weeks with no plans. thank you for the inspiration! Wows, we're on the same wavelength. I too have rekindled a thing for farro. Such a complement to veggies and feta. And I love it with tiny avocado cubes minced in, too. I'm going to be on the lookout for a new favorite brand to purchase. Any rec's? For my farro prep, I soak a cup in a bowl of water on the counter overnight, then pop it into my pressure cooker for 20 minutes, (I treat wheat berries the same way and the result is also perfection every time. )Farro also freezes well, a must-have as I navigate this first month of being a mommy. I make a roasted broccoli and farro salad I have the exact same sentiments about: oh this old thing? Didn't even think it worth mentioning even though there are some weeks I eat it every day. I don't know where I discovered it from, but I absolutely love it. I'm going to try your salad. congrats on flying across the country solo with a 5 month old. it does make one feel like an olympian, doesn't it? I recently attempted flying with 3 kids, and felt the same way! You can get locally grown Farro at PFI (Pacific Food Importers)…you must have been there in Seattle…amazing foods. So looking forward to your new book! Just re-read your last one – devoured it in about a day. Congratulations for making it though another round of edits! And that baby is a cutie pie! Oh this salad looks so delicious!! I feel the same way about farro- I love it but always forget about it! What an interesting and unexpected combination of mediterranean and thai flavors, I can't wait to try it (if I can ever remember to pick up some farro at the store)! At the beginning of most weeks, i cook a big pot of something to use as a base for lunch salads for my husband and i all week. It's usually either quinoa (love it as the base of a cold salad, especially with sugar snap peas, avocado, and a vinegary asian-flavored dressing), a mix of dry beans that i found at costco (again, used straight out of the fridge as the base of a cold salad), or lentils (cold, love it with cold roasted beets, raw mushrooms, and an earthy green like pea shoots or sprouts). I love farro but don't do it because my husband is gluten intolerant, unfortunately. But you've sparked an idea–i need to google barley to see if it's gluten free. . .aren't barley and farro pretty close in texture? Now i'm hungry for tomorrow's lunch already! Made this tonight for my family and a friend – loved, loved, loved it!!!! Thank you for sharing. As always, your recipes are always amazing. Only regret – they ate it all. I even doubled the farro and other ingredients. Farro is oddly hard to find here. I keep spotting recipes that I want to try though so may just need to order some online and be done with it. This sounds wonderful! 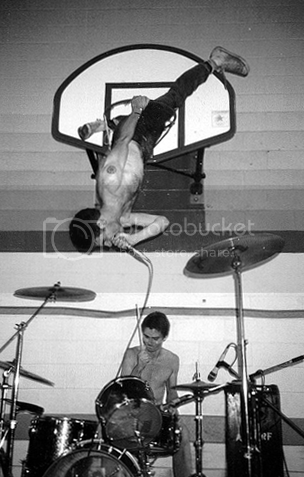 And I LOVE Fugazi. That sounds good. I haven't tried farro yet, think I'll give it a whirl. In the summer I keep cooked quinoa in the fridge for a refreshing salad with olive oil, whatever raw veggies I have around, feta and mint. It's yummy! How abought a whole grain episode of spilled milk? Sounds delicious! I need some quick, healthy lunch recipes. My 6-mo old daughter makes that face. We think she's wanting to talk and all that comes out is this little, “Eh.” So adorable and funny! I've not cooked with farro but have had it in restaurants. Will buy some to try soon. Found you via your book and it's going to help me with my blogging. Thanks. I loved the two pictures of your daughter – what a total cutie! looks delicious and June is beautiful! What brand of fish sauce do you like (if any)? I've never found one that I've “liked” and am curious if there's one you prefer?? This looks like the perfect thing to pack for a nice spring lunch! I'll give it a whirl! jwpatl, my favorite brand of fish sauce is Red Boat. Do you have any suggestions as a substitute for fish sauce? I am allergic to fish, but this sounds delicious! Adorable daughter!! If you don't mind, would you please share the brand of fish sauce you use. I find they vary a LOT. I'm still searching for a winner. Thank you! I just flipped through the Columns magazine I got this past week and saw an article about you! What a pleasant surprise and a great picture of you! i've never tried farro, but add feta and garlic to just about anything and i'll give it a go. looks yummy! hmm.. interesting! I haven't tried this Farro Salad yet and I love to taste this. I'm gonna try this after my travel to Morocco. Thanks much for sharing your recipe. Read it, tried it, and loved it. It is just amazing how food can reach so many people without uttering a single syllable just on the basis of its flavors. Can't wait to get my hands on your new book. BTW your baby is like a acme of cuteness. What exactly does Fish Sauce add to a recipe? I am a lifelong vegetarian, never tasted it. Is there a vegetarian substitute you can recommend? A peeve of mine is that blog comments are usually not made after making a recipe, just whether or not it sounds good. What help is that? So, here's a comment post-dinner… I'm terrible at following a recipe, because I like my own spin on things. So, thanks for the encouragement to elaborate with this recipe! We had it tonight, and it was super yum. I put washed and chopped kale in the bottom of my bowl; quite a bit actually. Then I fried up some Chinese sausage & dumped that on. When the farro was ready, I dumped it hot from the strainer onto the waiting greens & let it set awhile to wilt a bit while I chopped green onion, carrot, mint, cilantro & Thai basil. Then to dump the dressing on and toss. Very good, Molly, you never disappoint! I finally got around to making this on Easter, and the only thing I am sad about is that it took me so long to try out this salad out. I've been missing out for a whole year, what a waste! I was skeptical about the Asian style dressing with farro and feta, but it works perfectly. Doubled it and have eaten it every day this week. And looking forward to it again today. Thank you, thank you!